Matt Turley: Woodworker, designer, tutor. Matt Turley is a rebellious woodworker. He was born in 1972 with an independent streak. Working as an apprentice to a cabinet making firm in the English Lake District, he became disillusioned by the creative limitations and the use of endangered hardwoods. 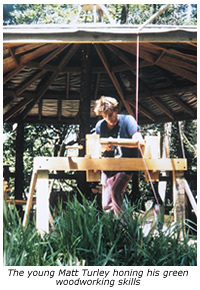 With a yearning to find a path with a deeper connection to the material itself and with sustainability at its core, he was fortunate to discover green-woodworking and also the practice of managing timber sustainably. The appeal of designing & making furniture, especially chair-making, burgeoned and it was to this process that he committed himself. It is now more than twenty years since he made those first steps in developing his own particular style of making; this has clearly matured into a refreshing contemporary aesthetic, whilst still maintaining a clear foundation in tradition. He places a strong emphasis on the use of hand tools, as well as the desire to produce a more tactile finish; this often embraces the very marks of the tools that are used to shape and create each piece, whilst offering a more sensuous and enriching experience to the user. When all is going well Matt has described the sensation he feels in his hands as if they are "singing"; he has truly found that deep connection within his work. For several years he worked as a journeyman in Ireland and Wales with several distinguished woodworkers, before returning more permanently to North Lancashire. His pieces have been exhibited in Canada and the U.S. as well as the U.K and have been purchased by clients as far afield as Japan. Matt lives in Lancaster and works in and around the South Lakes, Cumbria, creating individually made pieces of furniture, especially beds, tables and chairs, made to commission. He also runs a small number of green woodworking courses in the area each year.